Amazon Kindle Fire: will it be hackable? Amazon announced their long rumored tablet offering today, a 7″ Wi-Fi device named the Kindle Fire. The Fire will burn onto the scene on November 15th (preorders available now) at an amazingly low price of $199, making it an instant contender in the tablet arena, at least in price. CEO Jeff Bezos was short on specs, instead highlighting the many capabilities of the upcoming tablet. 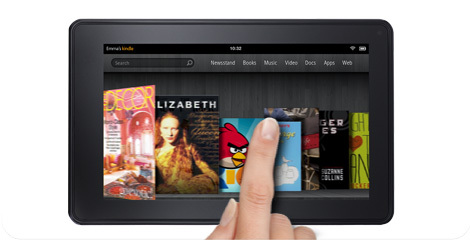 Amazon has built a custom UI on top of an unspecified version of Android for the Kindle Fire. These aren’t the droids you’re looking for. In fact, I hesitate to call this an Android tablet at all. The Kindle Fire won’t support the Android Market, it won’t look like Android and you won’t have the flexibility and freedom that a standard Android device offers. Instead, the Kindle Fire’s custom UI will feature tight knit integration into Amazon’s many digital services: Amazon Video On Demand, Amazon MP3’s and Music, Kindle eBooks, Cloud storage, the Amazon Android Market and more. I don’t think any other company could pull off a locked down Android-based tablet like this except for Amazon. With Amazon’s rich service offerings, the device & integration sounds promising. At this point, there has got to be thousands (millions?) of Android enthusiasts out there all pondering the same question: Is this thing hackable? A $199 tablet that could be modded to run a stock Android OS, giving full control and flexibility to the user, would be an enticing product. Of course, that is certainly something that Amazon wouldn’t like to see happening, so we’ll have to wait and see what control mechanisms, if any, they’ve built into the device to try to block flashing custom firmware. The other question is the tight Amazon service integration. If you flash to a standard Android OS, will you be able to use all the awesome Amazon cloud services offered by the stock Kindle Fire? If not, that in itself is a good reason not to flash your Fire. I’ll be keeping a close eye on the scene to see what develops. Odds are that someone will figure out how to flash a standard Android OS onto this puppy soon after it launches. Are you interested in the Kindle Fire? Very much like the Barnes & Noble, Nook color I would assume that the OS will be exploitable and the Amazon Fire application will still be accessible from it’s base android OS. Therefore while using the “tablet” as a tablet, you could access the “Amazon Fire Application” to access the Amazon marketplace / cloud browser/etc. Hi, im really interested in this tablet, off course the price is the main attractive but also the OS, the good thing is even Amazon is aware that Kindle Fire is gonna be rooted and the best thing is they doesnt care!